When I heard of the recent passing of Ole Miss legend Billy Brewer, I was instantly transported to the moment that he and I crossed paths in the summer of 1987. Our brief encounter certainly made no impact on his life, but it very likely did mine. Photo via The Clarion Ledger. My only true goal that summer was to hang out in Oxford and drop ten pounds. Easy, right? I was all set to swim laps in the Turner Center pool several times a week, and to run at least two miles on days I did not swim. In addition, at some point, while suffering from a fit of ludicrous ambition, I hastily made an insane decision with a friend of mine to ride bikes from Oxford to Sardis Lake and back at least once a week. To justify being there all summer, and, as an afterthought to all this well-intentioned physical fitness, I penciled in the easiest collection of credit hours available at the Ole Miss Law School. In an initiation into this summer of athletic frenzy, on the Sunday before our first class, my cycling partner and I biked Old Taylor Road from Oxford to Taylor Grocery and back. Unfortunately, we had no idea what time it was when we started, how long it would take to complete this round trip, and, most importantly, just how dark it would be as we rode the winding hills back to Oxford. This ill-planned excursion resulted in our calling each other names that implied impaired cognitive functioning, all the while dodging unsuspecting cars that whizzed past us. Past the the brilliant Juris Doctor candidates who had no bicycle lights and couldn’t tell time. Once school actually started, things got worse. The summer law classes exhibited an air of difficulty I had not intended, potentially causing an unreasonable infringement upon my time. The limited pool hours were not at all convenient, since classes apparently needed to be attended. That first ride to Taylor Grocery? It completely whipped my legs. And, alas, I discovered that, owing to some rare and obscure college town geographical abnormality, the innocent-looking streets of Oxford presented a couple three hundred thousand more hills to runners than to drivers of automobiles. Odd, but, scientifically tested by me, and indeed true. Then one particular day, still early into that summer of 1987, I began preparing for my longest run to date. Right there in class, I took great care to draw and log a new route onto a dedicated legal pad, oblivious to the lecture going on around me. After sketching out my challenging course, I decided that as soon as class was completed, I would drive the route to see if it was a full five miles, and then run it. I felt proud, and could feel the motivation building. Indeed, the barge was on the bottom. After class, a group of friends, at the insistence of my cycling partner, tracked me down with a lunchtime consensus. The food and drinks of my choosing were on them. While this generous offer gave me the perfect opportunity to drown the sorrows of my embarrassment and frustration, I had only a snack and tea, leaving them to rip and roar without me. I didn’t want to talk about it. I just wanted to do some thinking on a run. A long run. Unfortunately, the length of my run simply allowed more things to go wrong. First, even though dark clouds were moving in to block the sun, the steamy heat at the beginning of the run was stifling. Hotter than my seat in Admiralty Class. Next? My brand new top-of-the-line Walkman decided to select that hot, humid afternoon to hungrily scarf down my favorite REM cassette. As a result, I ran slightly off the roadway to dump the tape into a trash bin. No big deal, except that the sweat in my contacts caused me to misjudge the height of the curb, resulting in a turned ankle coming down off the sidewalk. Then, just as I switched the Walkman function to radio, Oxford’s album rock station broadcast a severe thunderstorm warning. And, finally, while I was conveniently two miles from my apartment, running uphill with a sore ankle, said thunderstorm hit, testing the water resistance of my treasured Walkman, and thoroughly soaking my favorite pair of New Balance. Oddly enough, I had never quit running despite the heat, the rain, the hills, the ankle, and the humiliation. Making it back to campus, and closer to my apartment, I started to notice just how rubbery my legs had become. They truly began to revolt. My breathing was now irregular. I could feel blisters forming on the balls of both feet, probably because of the unnatural moisture throughout my shoes. This run, and my condition while running, represented the status of my world at that moment. All I wanted to do was to simply quit running and sit on a bench. Similarly, based on the embarrassment that I had endured in class, I really wanted to drop it right then and worry about the consequences later. Maybe even forget the whole idea of finishing this silly degree right now. “Credentialing” myself just looked like it was setting me up for a lot of stress and work anyway. As I reached the beginning of a monsterous hill not far from the stadium, my ailing running form resembled a hobbling turkey, swinging from side to side, neck extended, looking down. Time to stop the madness, I decided. Time to quit running. Time to drop Admiralty Law. Time to rethink the whole law school plan. The instant before I relaxed to walk, though, I heard a couple of loud claps. “PICK IT UP, SON,” a somewhat familiar deep southern voice yelled. I summoned all the energy left on earth and lifted my head just enough to make out a figure, seemingly clapping in slow motion, looking right at me. “Who is that yelling at me?” I thought, even though I was too tired to think. The mannerisms of the figure looked familiar, as if I was dreaming. Needed to keep running just to get closer to the voice. “Holy crap, it’s Billy Brewer,” I managed to realize. Billy was standing in the steamy summer humidity, at the top of the hill. He had to have been outside checking the weather, as the downpour had just stopped. I approached the top of the hill, hurting badly. Legs, lungs, ankle, feet, pride . . . everything about me that could hurt was. I miraculously reached the top of the hill, with still a mile to go. However, I was suddenly not limping quite as badly. My path now was on the sidewalk directly in front of Coach Brewer. “Yessir, Coach,” I panted, picking up the pace and finding a sliver of determination somewhere in Coach Brewer’s encouragement. “Never quit,” I echoed in some form of communication that was ninety percent exhale, and the other “half” grunt. Even though I couldn’t say it out loud more than once, I repeated it in my head, to the rhythm loosely established by my rubbery legs and aching feet and sore ankle. I repeated it in my head all the way home. I repeated it when real life as a real attorney showed me tougher situations than I had ever imagined as a law student. Billy Brewer said those words to me in 1987. Others in the Ole Miss family surely heard him say the same thing. 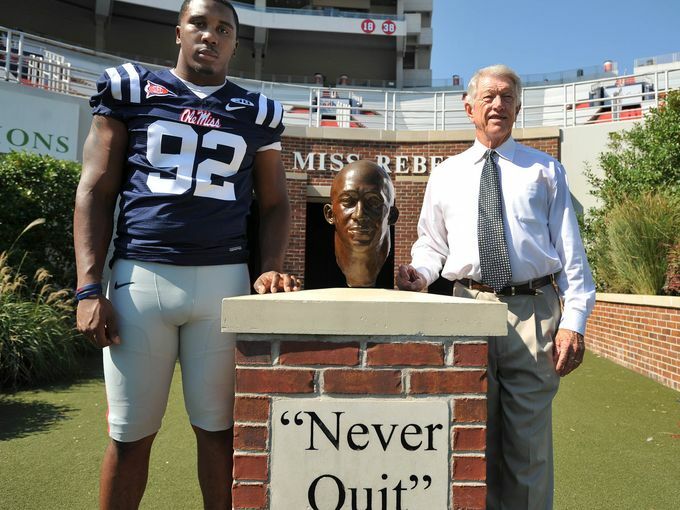 The quote underneath Chucky Mullins’ bust at the Vaught is “Never quit.” Chucky certainly owns that quote, and it is his forever. Yet, to me, coach and player…especially THAT COACH and THAT PLAYER represent the same message. Even this past football season, the recurring theme of current head coach Matt Luke could be summed up in two words: “Never quit.” You can bet that Matt’s brother Tommy heard those words from Billy Brewer more than once. John T. McMullan received his law degree from Ole Miss thirty years ago. Since then he has seen all sorts of stories unfold, in court and out.